Nothing in the medical world is the way it used to be. Change is everywhere. The economic pressures, the political pressures and the very men and women who choose medicine as a career, has all being undergoing disruption. Add to this maelstrom the issue of race. 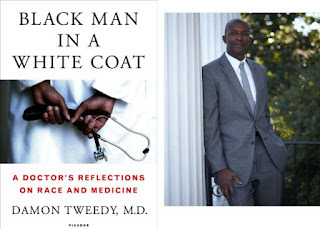 The shocking lack of black physicians, diseases that overwhelming impact black communities and the inherent complexities of race in the doctor/patient relationship and you see some of the problem in medicine that have confronted Dr. Damon Tweedy. A graduate of Duke Medical School and Yale Law School Dr. Tweedy shares his personal story in his memoir Black Man in a White Coat: A Doctor's Reflections on Race and Medicine . I Wonder Who's Kissinger Now? How Well Do We Really Know Our Parents? Where Is The Truth We Have Lost In Information?